The Angriest: Star Trek: The Next Generation: "Journey's End"
It is 28 March 1994, and time for another episode of Star Trek: The Next Generation. 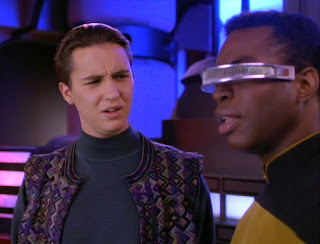 While Captain Picard (Patrick Stewart) attempts to relocate a Native American colony that has fallen under Cardassian territory, Wesley Crusher (Wil Wheaton) returns to the USS Enterprise. With the seventh and final season wrapping up, and The Next Generation soon to be replaced by new spin-off Voyager, "Journey's End" tries to kill two birds with one stone: giving former series regular Wesley Crusher one last send-off, and introducing the idea of Native Americans living near Cardassian space. The former feels necessary: the last time viewers saw Wesley he was disgraced at Starfleet Academy and held back a year. It's nice to find out what happens next. The latter is just plain odd: while Voyager will feature a Native American first officer, the colony and events here never get referenced. It's foreshadowing without a purpose. Ignoring the attempted Voyager link, and the main storyline is relatively enjoyable without ever feeling particularly strong. Native Americans living on their own distant colony, far from Earth, does feel like an innately Star Trek sort of an idea. The continuing use of the Cardassians works well too, tying the episode into the ongoing storylines in sister series Deep Space Nine. It is great to see Gul Evek (Richard Poe) back. The use of semi-regular characters give a consistency to the Star Trek universe, and he's a strong performer. The Wesley Crusher subplot struggles a little. It begins with Wesley acting petulantly onboard the Enterprise; offending La Forge (LeVar Burton), being rude to his mother (Gates McFadden), and generally sulking around the place. Things pick up when he visits the planet's surface and gets drawn into the relocation crisis. It ultimately shifts him to a place where he is siding with the colonists against Starfleet - and that, of course, brings him up against Picard and the admission that's been torturing Wesley for the whole episode: he doesn't want to be a Starfleet officer any more. That shift makes up for any awkwardness in the episode's early scenes. Up into now Starfleet has been represented as a sort of pinnacle career in the 24th century: something all sensible, talented people would aspire to join. For Wesley to turn away from seven season's worth of character and choose his own path independent of the Enterprise feels like a big deal, and a strong validation of character. The climactic scenes pull in the mysterious Traveler (Eric Menyuk) from all the way back in Season 1's "Where No One Has Gone Before". I understand the desire to bring the character back and tie him into Wesley's future - it was something they set up back in that original episode - but the idea of Wesley becoming a trascendant intelligence beyond humanity never felt right, and still feels deeply silly here. To an extent it fouls his exit. The resolution to the Native American colony's problems is more satisfactory. They make the deliberate choice to fall under Cardassian control. As with Wesley's exit from Starfleet, the colony's exit from the entire United Federation of Planets feels like an affront to everything Star Trek normally represents, and is all the more stronger for it. "Journey's End" is imperfect, but a unified theme across its storylines and some great key scenes and conversations ultimately make it an enjoyable episode. With 11 good episodes out of 20, Season 7's quality ratio rises again to 55 per cent.